Is this the real life...or is it fantasy? Oh, it's real. The moment we learned about Vigilante Bar, we knew we had to go. It's more than a bar with food. 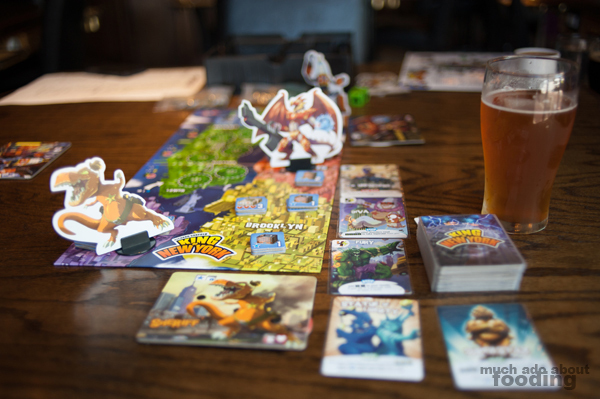 It's a unique experience that recently opened to the excitement of those who enjoy gathering for board games. However, rather than just be a ragtag location with a jumble of used board games for the public, Vigilante has done something more special. It has elevated the recent enthusiasm that many have found in the hobby and has designed itself to befit the "modern, grown-up nerd," as they claim. There is quality to the food and drink menus, service, and furnishings in addition to innovative uses of technology that cater to the guests. When we first stepped in, we were immediately impressed by the decor. 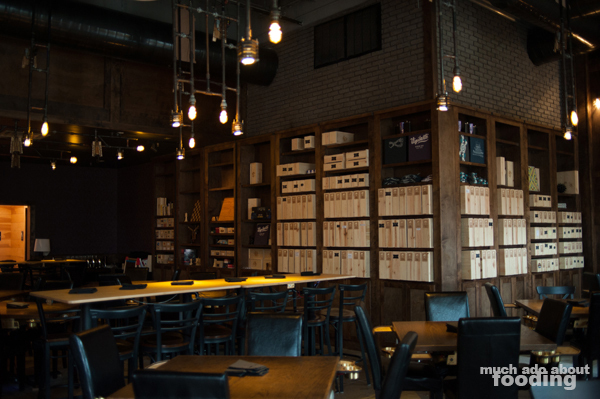 Well-designed and modern with a flair of geekiness, the interior looked carefully curated to appeal to small and large groups. 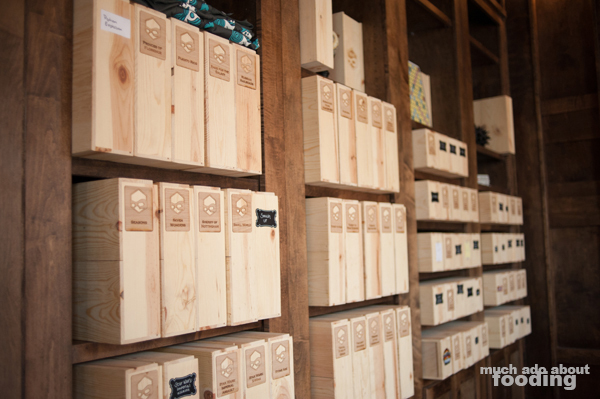 In one section, you'll spot the board game library where shelves are lined with custom-built boxes with engraved game titles. 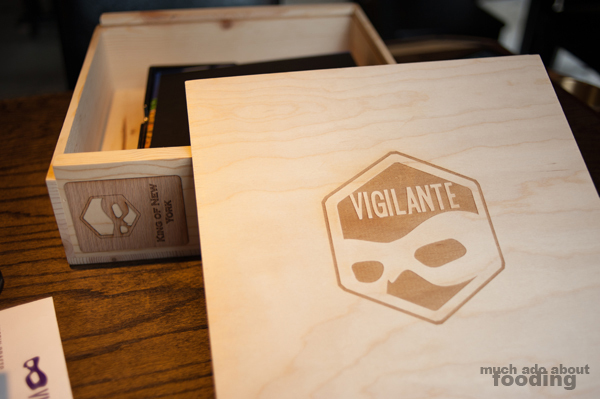 Boasting several hundred games, Vigilante Bar takes their stock seriously and the presentation is akin to serving a platter of delightful bites in front of a diner - when the waiter/waitress slides open the box, you'll see your tantalizing game inside. In fact, you even order the games from a tablet menu where you can select how many players you have, how much time you have, and more. Not only is the library impressive but so are the custom-made tables. Each table features cup holders, food trays, card holders, meeple drawers, outlets, a switch to let others know you want more players, and service call buttons that are charmingly labeled, "Accio server!" (for the Harry Potter fans). 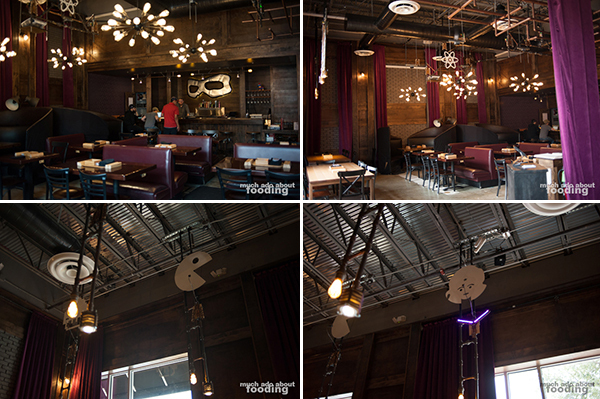 Above your table is a unique icon (such as Pac-man) and a light-up indicator; when you hit the service call button, the indicator's "wings" light up and raise so the waiter/waitress knows you need something. Why do it this way? They don't want to interrupt your game if you don't want to be disturbed! 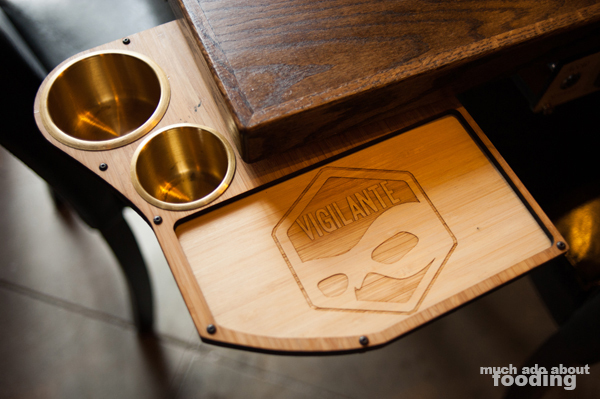 We've been back to Vigilante Bar several times now, bringing people to see how impressed they are with the set-up. So far, raving reviews! Not only are there hundreds of games to choose from, there is also a great selection of libations and food items that can be eaten without worry of distracting from gameplay. We've tried out their Elote Taquitos ($5 - chef's creation: fresh roasted corn with bell pepper and onion wrapped in a tortilla and fried, served with green chile ranch), Honey Walnut Shrimp Roll ($6 - crispy shrimp and candied walnuts drenched in a sweet sauce with seasoned rice wrapped in nori and topped with sriracha aioli), and Falafel Bites ($4 - with cucumber mint sauce) before on separate occasions. Of the three, we favored the honey walnut shrimp roll the most due to its balanced mix of textures and the play of sweet with savory. All of them made for easy snacking while drinking a cold brew and beating each other at our games of choice. If this has you chomping at the bit to go to Vigilante Bar with some friends, you can find them at 7010 Easy Wind Dr, Austin, TX 78752, open until the wee hours of the night. It costs $5 per person to make use of their board game library but last we saw, they also are open to people bringing in their own games to play. If you're looking for more players, the people we've met there are a jolly bunch and would probably join you!